D+P Client RDA Group, a global provider of quality-tracking and customer-satisfaction studies to the world’s largest auto manufacturers, has been acquired by Ipsos, the worldwide market research firm. Research Data Analysis, Inc. was founded in 1969 by Tony Pietrowski, the father of the current President, Donald Pietrowski, and is headquartered in the US, near Detroit (Bloomfield Hills, Michigan). With this acquisition, Ipsos aims to develop an integrated global product offering in the field of Quality Tracking. RDA Group is an innovative, consultative process driven company, recognized for its ability to integrate data from multiple databases (survey returns, proprietary client-specific processes, product and engineering metrics), generating high-value strategic insights and actionable recommendations. – While Ipsos has strong leading positions in Latin America, Europe, South Africa and China, RDA Group has solid positions in the US market. – The client portfolio of the combined entities gives Ipsos a much stronger footprint in the automotive industry. 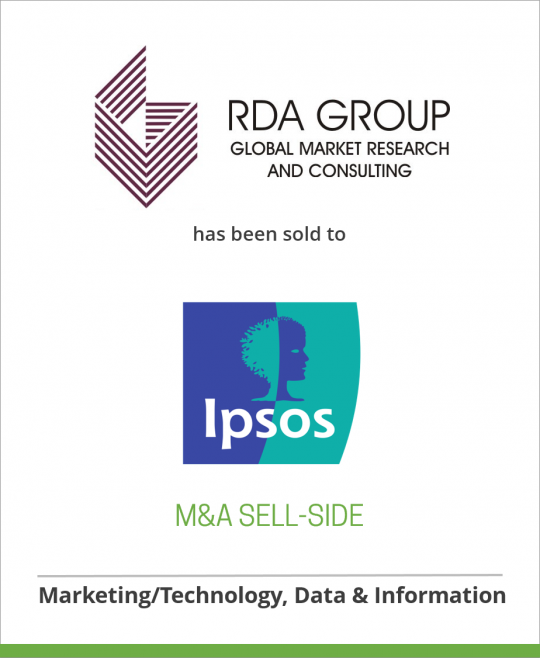 – RDA Group’s quality-measurement and reporting platforms will strengthen Ipsos’s existing syndicated club-studies. Combining RDA Group’s strengths with the recognized expertise of Ipsos Loyalty in the automotive area, Ipsos clients will be able to benefit from powerful, actionable and cost-effective quality and customer satisfaction measures across all of their markets, easily accessible within their organizations. Ipsos ranks third in the global research industry. With a strong presence in 87 countries, Ipsos employs more than 16,000 people and has the ability to conduct research programs in more than 100 countries. Founded in France in 1975, Ipsos is controlled and managed by research professionals. They have built a solid Group around a multi-specialist positioning – Media and advertising research; Marketing research; Client and employee relationship management; Opinion & social research; Mobile, Online, Offline data collection and delivery. Ipsos has been listed on the Paris Stock Exchange since 1999. Headquartered in Michigan, RDA Group established itself in the 1970s, the company is now a global, full-service market research and consulting firm. With revenue of $25 million, it employs 180 professionals and conducts ongoing projects in more than 60 countries. The company serves many of the world’s largest auto manufacturers.